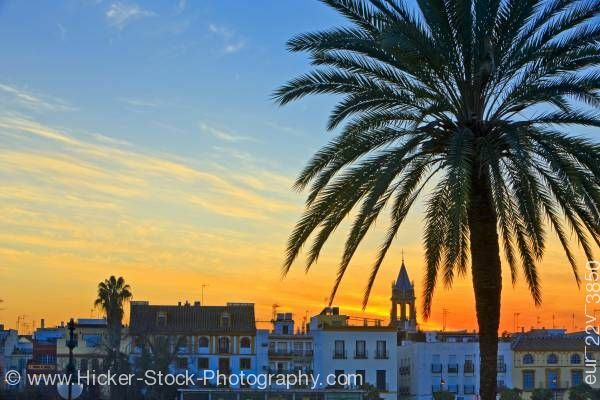 Stock photo of the Triana District at sunset in the City of Sevilla, Province of Sevilla, Andalusia, Spain, Europe. The beautiful sunset is the backdrop for the white painted Triana District in the City of Sevilla. This stock photo shows the view across the Rio Guadalquivir river towards the Triana District in the City of Sevilla, Province of Sevilla, Andalusia, Spain, Europe. The beautiful sunset is a backdrop for the white painted Triana District. Buildings of different sizes and rectangular windows some trimmed in gold or black. A few palm trees sit among the buildings. The decorative bell tower of Iglesia de Santa Ana church sits in the background. In the foreground to the right is a tall beautiful palm tree. The sunset sits low and shows off its wonderful colors of orange and yellow just above the town. Above, the sky is a soft blue with clouds softly streaked though. Looking across the Rio Guadalquivir (river) towards the Triana District and the bell tower of Iglesia de Santa Ana (church) at sunset in the City of Sevilla (Seville), Province of Sevilla, Andalusia (Andalucia), Spain, Europe.